RK Sport Fiberglass Ram Air Style Hood 11-up Dodge Durango RK Sport Fiberglass Ram Air Style Hood 11-up Dodge Durango, Dodge Durango Fiberglass Ram Air Style Hood, Dodge Durango Fiberglass Hood, Dodge Durango Ram Air Style Hood, Dodge Durango Custom Hood, Dodge Durango Fiberglass Hood, Durango Fiberglass Hood, [RK Sport 44011000 Hood] - $719.95 : 3rd Strike Performance, Your Source for Late Model MOPAR Performance Parts and Accessories! A functional Ram Air Hood which will not only set your Durango apart from the crowd will also offers you added performance. 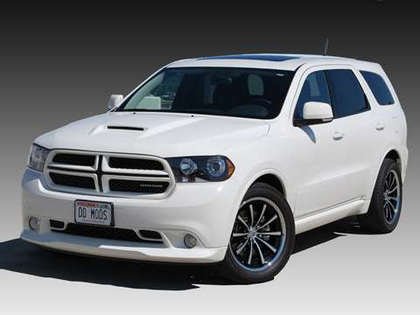 Constructed from hand laid, hi-temp fiberglass, their fully functional Ram Air Hood will fit all 11-up Durango's. Helps to elevate your Durango above the rest! RK Sport was founded by R.K. Smith. R.K. knows first-hand with his extensive racing background that having the best team makes a winning program in both racing and business. In 1982 R.K. was named Southern California's SCCA Driver of the Year. Then in 1983 and 1985, R.K. won two National Championship titles in a prototype Swift. In 1990 and 1992, he won two World Challenge titles in a Corvette. Finally, in 1993 with his experiences both on and off the track, R.K. founded RK Sport, Inc.